Becoming a member of Toastmasters is done by joining a club. The best thing to do is visit one or more clubs to give you an idea of what Toastmasters can offer and which club is best for you. By becoming a member of Toastmasters, you make a major decision, which requires commitment. In order to benefit the most from Toastmasters, you must be willing and able to put the effort in. Others will also count on you for their growth, like you will depend on them for yours. It is the members who inspire, motivate and coach within Toastmasters. Toastmasters is a non-profit organisation and does not use expensive trainers. The membership fee of Toastmasters is very low compared to commercial training. A simple presentation training of several days often takes thousands euros. Membership of a Toastmaster Club is just a few hundreds euro’s for a full year. By joining a Toastmasters club, you are automatically a member of Toastmasters International, and have acces to the many free materials and access to the webshop of Toastmasters International. Plus you will receive the free monthly magazine of Toastmasters. 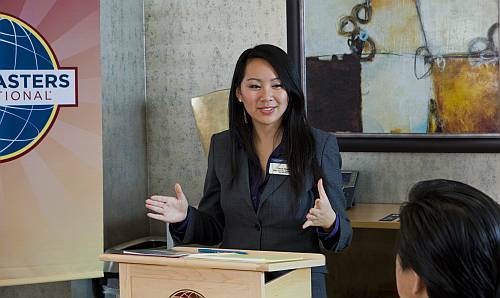 Visit one of the clubs, and ask the Vice President Membership how to become a member of Toastmasters. You can expect a warm welcome. It just might be your most important decision this year!